Last week I wrote about an email I received from a wine club I belong to. The intent of that post was to give a warning about how not to run a wine club. Basically, the winery decided that it would “do me a favor” by increasing my wine club shipments by 50% per year without providing any options to keep my shipments as they were or any other way not to receive an additional half case of wine. While it may not seem like it to you readers, I actually do have a wine budget. Adding 6 extra bottles from one club, plus the shipping costs, would take a bite out of that budget and limit the diversity of wineries I am able to buy from. I wanted to give the winery a chance to respond to my concerns and see if I could resolve this issue while remaining a club member which is why I declined to name the winery in the first post. Unfortunately, and I say this with the utmost sincerity since I really love this winery and its wines, I am unable to remain a member. I reached the winery mid-week and expressed my concerns about the increase in the wines sent each year and the associated costs, how a case and a half of wine from the same winery just in club shipments seemed a bit much, and the burden of shipping costs plus the inherent inefficiency of shipping 9 bottles at a time to the East Coast really wasn’t going to work for me. The person I spoke to on the phone informed me that the rationale for expanding the club requirements was because club members were not currently getting to taste all the wines offered because they were selling out in the tasting room before the club members could order since they hadn’t gotten a bottle to taste in their tasting packs. Additionally, she told me I shouldn’t worry about the shipping because they’ve negotiated a special 9-bottle rate that’s less than the shipping for a full case. First. You have at least 18 different wines you produce a year? Holy cow!! Second, I don’t need to taste every current release you have (this club has never sent me an older vintage or anything like that), I truly do not believe that is the point of being a club member. The point is to taste a sampling. And finally, I stick by my assertion that you should be doing everything you can to make sure your club members can stay with you through this downturn, and not be pushing them away by increasing the cost of membership. So Bella, as much as it saddens me to do so, I bid you adieu. I see you have a waiting list for your wine club, so I guess you won’t miss me. On the night of the last Twitter Taste Live, we opened 4 bottles to discuss. Now, even though we are winos here, 4 bottles are way too many for us to drink in one day. So we took a page out of Dhonig’s book and kept parts of 3 of the bottles around for night two (and night three in one case). 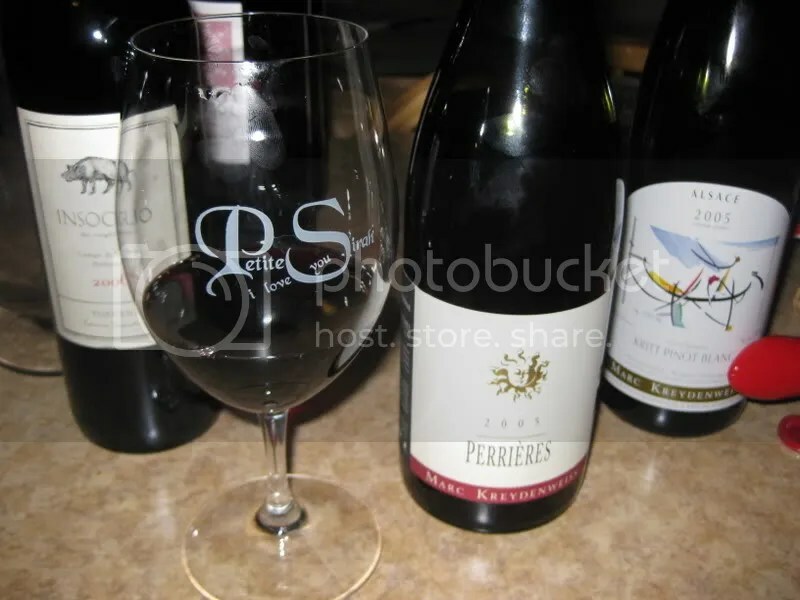 We drank the remainder of the third bottle on night 2, the 2005 Marc Kreydenweiss Perrieres. The wine had a real cork closure, clocked in at 13.5% alcohol by volume, and retails for around $14. I paid something less than that as I bought it in a tasting pack for the TTL from Bin Ends Wine. The wine is a belnd of 20% Syrah, 20% Grenache, and 60% Carignan. On pouring a glass on night one, I first thought “Hello funk.” I also found eucalyptus, raisins, dark fruit, earth, barnyard, band aid, and not a whole lot of fruit. I thought it needed time. While the wine showed a bit more fruit in the mouth, I still got lots of eucalyptus, leather, earth, and funk. 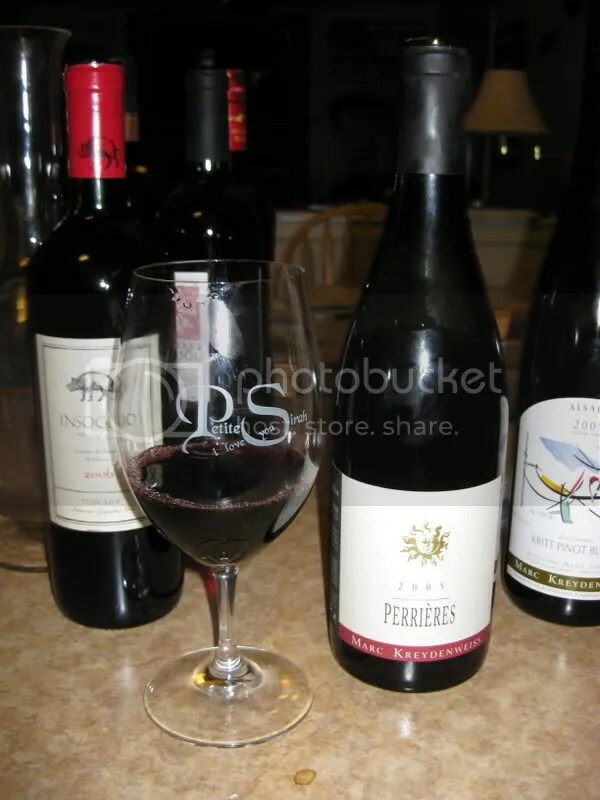 I found some berries, really dark currants, and a bit of tart fruit, but overall, the wine seemed tight and tannic. Night two showed a wine that still had a really dirty funky nose with eucalyptus, currants, and pencil lead showing through. In the mouth on night two I got cranberry, dirt, cherry, pomegrante, tart fruit, pencil lead, and spice. It still had tannins and structure to spare. Overall, decant this one vigorously. It held up really well into night two, so I’d expect that this one could probably age some more, which is pretty high praise for a $14 bottle of wine.